Friday the 13th: The Series is an American-Canadian horror television series that ran for three seasons, from October 3, 1987 to May 26, 1990 in first-run syndication. The series follows Micki and Ryan, owners of an antiques store, and their assistant, Jack Marshak, as they try to recover cursed antiques, to put them into safety in the store's vault. Originally, the series was to be titled The 13th Hour, but producer Frank Mancuso, Jr. thought this would turn away viewers and instead took the name Friday the 13th to deliberately draw in audiences. Despite this title, the series has no story connections to the film series of the same name, as Jason Voorhees does not make an appearance, nor does any character connected to the films. 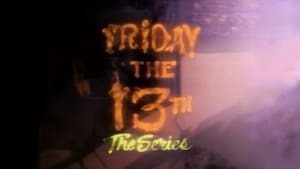 In the United Kingdom it was listed on TV schedules as Fridays Curse, though when going to advertisement breaks on ITV it would show as Friday the 13th: The series. The two series have several cast and crew ties, however. The show's producer, Frank Mancuso, Jr., was producer of the movie series from Friday the 13th Part 2 until the final installment distributed by Paramount. The show's star, John D. LeMay, went on to star in Jason Goes to Hell: The Final Friday, guest star John Shepherd played Tommy Jarvis in Friday the 13th: A New Beginning, and episode director David Cronenberg appeared in Jason X. Fred Mollin, Rob Hedden, and Tom McLoughlin worked behind the scenes of both series.